Valve Springs are subject to two types of friction. The first is internal friction that occurs due to the movement of the spring as it flexes. The second is external and is developed as the spring moves against another surface. Even single spring sets develop friction through rubbing against the head/ shim and the retainer. The result of this friction is heat and wear. By far heat is the greatest enemy of steel springs. Steel springs will fatigue if the temperature of the spring reaches 400F. At this point the spring will lose a significant amount of its designed tension and will be essentially useless for per formance use. Stainless springs can generally handle temperatures approaching 900F. By applying a properly formulated Dry Film Lubricant, the life of the spring can be enhanced significantly. In testing, valve spring life in Performance Applications has shown increases from 2 to 10 times the norm. How is this accomplished? Primarily through a reduction in the heat generated by friction. This is accomplished through more efficient thermal transfer. In addition, the lubricity of the coating will reduce the heat that is generated by externally induced friction. The heat that is generated can actually cause the spring to break, not just fatigue. This might be likened to the effect of flexing a piece of steel. If repeated flexing is done the metal will eventually break at the point showing the most deflection, which many times are also the thinnest areas. That point will also be very hot to the touch as the internal friction is highest at that point. The amount of heat that is generated by a valve spring in motion will vary over the surface of the spring. When multiple springs are run together in a stack, the frictional created heat is increased. By coating a spring we reduce the heat that can build up in two ways. The First is through the red uction in externally generated friction. By coating the spring, sliding or rubbing friction is reduced with a measurable reduction in the valve spring temperature. The Second way is very important. A properly formulated coating will also more evenly distribute the heat over the surface of the spring reducing the likelihood of generating a hot spot, leading to breakage. In addition, a properly formulated coating will aid in more rapid transfer of the heat generated to the oil, which cools the spring. Unfortunately, some coating systems actually insulate the spring from the oil which can have a detrimental effect on spring life. The ability of a coating to reduce friction also means it will reduce wear. Since valve springs do not uniformly contact another surface, the wear pattern is not even. 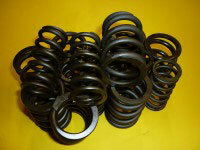 As wear occurs, the spring can become weaker in these areas and ultimately break. This is particularly true in multiple spring stacks, but is also seen in single spring application. Considering that in many racing applications, springs will barely survive the race, any increase in the ability of the spring to maintain proper seat pressure is desirable. By combining reduced friction and wear with reduced heat generation and enhanced cooling of the spring, spring life and performance can dramatically increase.